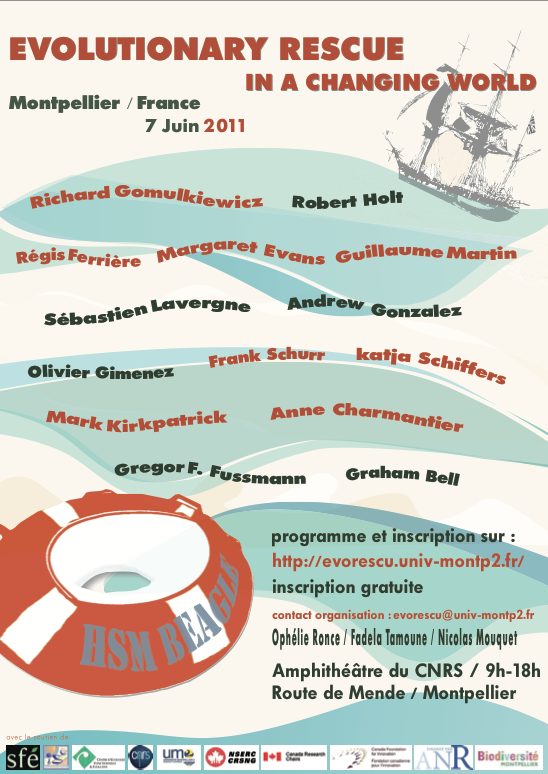 In June 2011 the French Ecological Society has supported a conference on Evolutionary Rescue hosted in Montpellier. The aim of this conference was to synthesize recent advances improving our understanding of the role of evolutionary mechanisms in species responses to global change and of how these mechanisms may affect biodiversity patterns. The video of this conference will be realeased online on our website during the month of october 2011 (one topic every week). The video are open to comments and we hope you will participate to this very original experience of « virtual » conference by posting your questions. 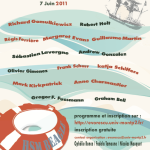 The authors will try to respond online, this is a unique opportunity to bring the scientific discussion beyong the limit of a one day conference ! 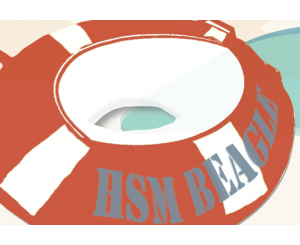 Please post your comments in the « Ecrire un commentaire » section at the end of this page. Make clear in your question to what talk you are refering to. All evolution within species, including the capacity for evolutionary rescue and the potential for evolutionary suicide, occurs in a community context. Natural enemy-victim interactions, broadly defined to include predator-prey, host-pathogen, and plant-herbivore interactions, are pervasive in natural communities, and are prone to unstable population dynamics. Such interactions can both indirectly and directly influence evolution within a focal species, at times amplifying the potential for evolutionary rescue, and at times hampering it. This can occur via shifts in the demographic context of evolutionary responses to abiotic stressors, and via evolutionary responses in the interactions themselves. In this talk, we will use theoretical models to explore these phenomena in both spatially closed communities (e.g., on an oceanic island), and in spatially open communities (e.g., shifting species ranges along gradients in a continent). Eco-evolutionary dynamics of mutualisms in changing environments. In mutualisms, feedbacks between ecology and evolution are key to the long-term coexistence of the interacting species and the stability of their association. This makes mutualisms choice model systems to study how eco-evolutionary feedbacks mediate the response of community diversity and stability to environmental perturbations. Here we present a simple model for the coevolutionary dynamics and diversification of mutualists driven by eco-evolutionary feedbacks. The model assumes genetic variation in the amount of individual resources invested in the mutualism function. Competition for partners and the ‘competition-cooperation trade-off’ determine the speed of evolutionary diversification and the phenotypic range and richness evolving in the community. Relatively rapid diversification is followed by a stationary phase of speciation-extinction. Two clades can be distinguished. A clade of ‘good’ mutualists originates from the top branch of the evolutionary tree that springs out of the early diversification phase. The clade is evolutionary dynamic: its composition is driven by a cycle of evolutionary branching and suicide. A clade of ‘bad’ mutualists evolves during the early phase of diversification and shows strong evolutionary stasis. These patterns underlay four predictable responses of the community to changing environments. (1) The clade of bad mutualists fills up the ‘exploitation niche’ and may thus act as an ecological buffer against invasion by outsiders. (2) Although the abundance of each bad mutualist species is generally low, losing any one of them can have dramatic ecological and evolutionary consequences. (3) Good mutualists are protected against the threat of environmental perturbation by high abundance; accidental extinctions can be offset by rapid evolutionary regeneration. (4) Environmental change that affects the shape of the competition-cooperation trade-off will impact the community through both ecological and evolutionary effects. Evolving communities: the role of intrinsic and extrinsic environments. Rapid evolution is a mechanism by which populations forming ecological communities can adapt to the changing environment and persist. Commonly, the “environment” is assumed to be an extrinsic factor that changes and, thereby, challenges communities to adapt, with no or little feedback from the evolving community to the environment (e.g., climate, temperature). Yet, communities may also generate their own, intrinsic “environment”, for instance, through regular fluctuations of predation levels. I present case studies of adaptation to changes in extrinsic and intrinsic environments. Focal attention will be given to experimental phytoplankton systems that show evolutionary adaptive responses to increasing atmospheric CO2 (extrinsic change) or to oscillations in herbivorous zooplankton densities (intrinsic change).